I found this sign at a local shop and decided I wanted to bring it home. 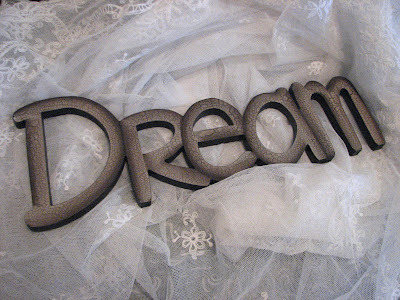 We all like to ~ Dream ~ I will hang it up in my Guest Bedroom/Vintage Clothing Room for inspiration. 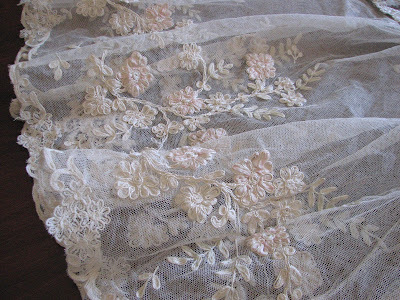 I gave this antique net lace a gentle soak over the weekend and it came out beautifully. I have about 15 pieces that appear to have been part of the most stunning dress. It is an absolute shame that someone chopped it all up. I see no damage on the individual pieces, so I think this is all scissor work. I wonder if the guilty party had any clue about the value of a Net Lace Gown in MINT condition. Such a shame. I tried putting it all on my kitchen table to see how much of it was remaining. Not enough to play Humpty Dumpty I am afraid. 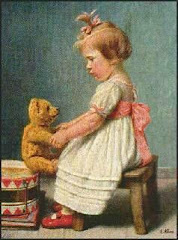 I guess it will have to be used in combination with a new creation or a restoration of some other gown. The silk ribbon work is gorgeous. There are many talented ladies on Etsy that could surely make this into something formal again. The bottom portion is still intact as a full skirt. It could be the bottom of a new gown or perhaps a doll dress, or even a little flower girl dress. Wouldn't that be sweet! I also have over 120 inches of vintage wedding veil net. Pretty Tambour embroidery. 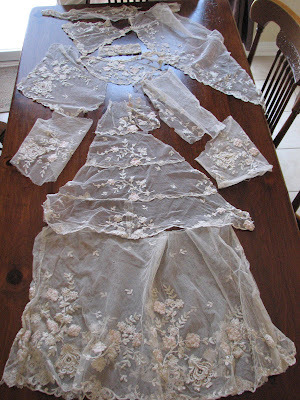 I also have two vintage wedding gowns that I need to finish repairing . . . before the weather gets too nice! I will aim for Friday . . . . . Blogs are a good way to set a timeline! OH MY HOw could any one cut up such beauty. I guess a scorn woman. lol.. It will indeed make something else very beautiful.. I know you must drool when you look at it. 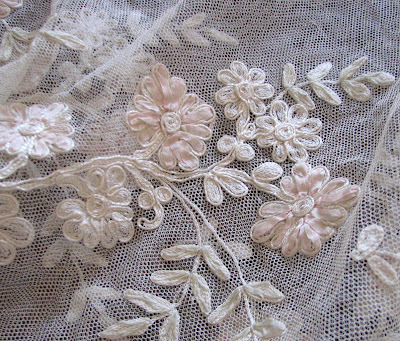 What very pretty lace and you would wonder how someone could ruin, what would have been a beautiful gown. I loved the thought that you will soon be swimming in your pool, must be wonderful after the snow and cold weather you have had. Karen, I love these gorgeous lace peices... I will be keeping my eye on your shop. ;)) I have a little doll that woudl be SO lovely with some of those pieces. You have such beautiful pieces to list this week. Absolutely gorgeous! 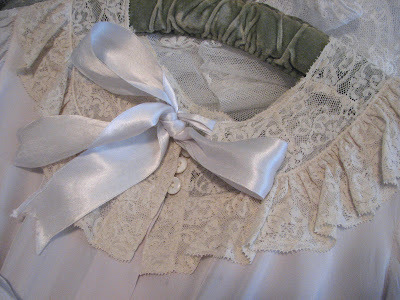 I can think of dozens of usees for that wonderful lace:) What fun! HI Karen...Oh, so beautiful. I can think of a million things to do with that lace! What a shame that someone cut it...but there must have been a reason...possibly the same reason I would...for another purpose. Poor Cider...they can do some silly things! Swooning over that lace! Gorgeous. Hope your enjoying your spring! Oh how beautiful!!! The design sign is great! What a lovely little flower girl dress that would make. 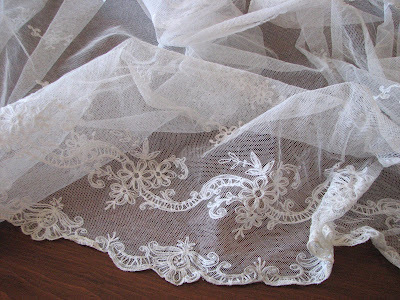 As a bride to be in an Edwardian themed wedding I've been trying to find a tambour lace veil (to no avail!). 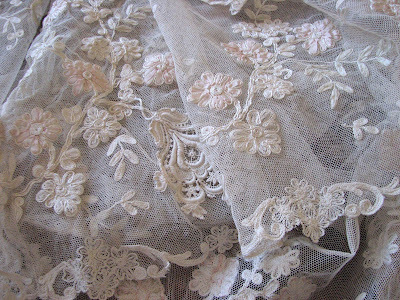 The lace is absolutely stunning, cant believe someone cut it up!